There’s no better way to learn the history and the culture of a destination than exploring on foot. 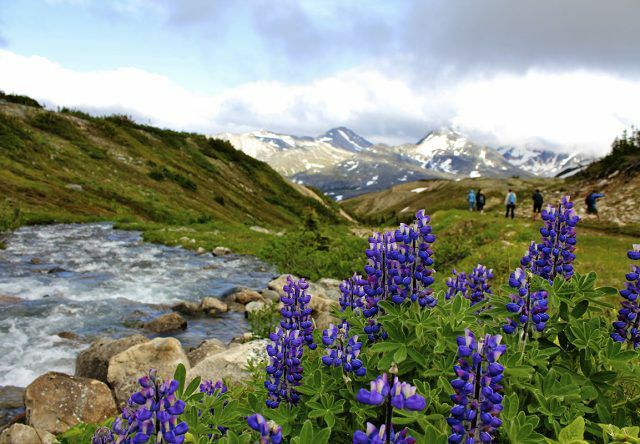 Visitors to Alaska and the Yukon can look forward to doing just that on the many walking tours throughout the region. Grab your camera, your walking shoes and stretch your legs (instead of your wallet) while enjoying the history of the North! Anchorage – Known as “tent city” in its early years for the instrumental involvement with the construction of the Alaska Railroad, Anchorage is considered a young city but with a very rich history. Stroll the streets of downtown with an audio guide featuring some of Anchorage’s most iconic mayors recalling events during their time in office. Learn about the early days of mushing, the oldest businesses in the area, how the 1964 earthquake shook the town and more, with 17 different stops along the way. Find the free audio tour with the Alaska App, available on iTunes. Juneau – Southeast Alaska has a temperate rainforest climate and is home to the Tongass National Forest, the largest national forest in the United States. In rain or shine, the many types of flora in Southeast are a great reason to hike around and see how many different types you can spot. Put on your nature gear and observe the various types of trees found in Juneau on the Juneau Tree Walk. Download the Juneau Tree Walk pamphlet, identifying the locations and the species of 21 different trees in the Juneau area, and keep your eyes peeled for wildlife along the way! Skagway – Visitors to Skagway will be transported back in time to the booming gold rush days. The town served as the starting place for more than 40,000 gold rush stampeders traveling to the Yukon along the Chilkoot Trail. The National Park Service offers free, daily walking tours of Skagway’s historic district as part of the Klondike Gold Rush National Historical Park. The park is made up of six blocks and more than 20 buildings that are managed and maintained by the National Park Service to honor the stampeders of the Klondike Gold Rush. Stop by the National Park Visitor Center on 2nd and Broadway to begin your walking tour adventure! Whitehorse – Whitehorse boasts beauty not only in its natural environment but also in the public art displayed throughout the community. The Whitehorse Art Walk gives visitors a guide to 19 pieces of art located in the downtown Whitehorse. Download the free map and free audio guide for information on each piece or check out an audio player from the Yukon Historical and Museums Association office!